The New Jersey Devils have had many of their prospects play in the NHL this season. With injuries to multiple key players, specifically Taylor Hall, roster spots opened up for their young players to gain NHL experience. It may not mean much for this season, which has been a lost cause for some time, but it will have an impact on the Devils’ offseason, and as they head into training camp in September. Those numbers also make a case that the Devils should’ve sent him to the AHL sooner than they did. 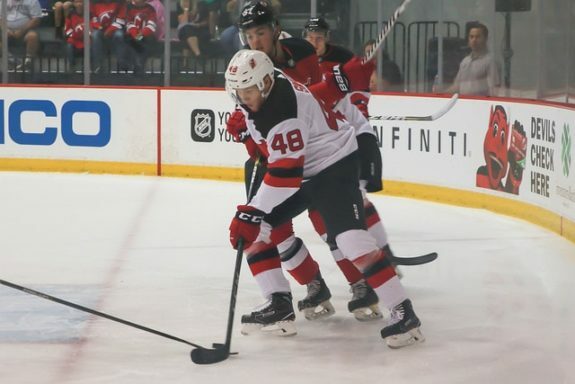 The good news is that Seney is thriving with the Binghamton Devils, even though the team isn’t playing well. He has 18 points in 20 games and is centering Binghamton’s top line, so he’s getting the minutes he needs to develop. The hope is Seney’s time in the AHL will benefit him heading into next training camp. He’s only 5-foot-9, 157 pounds, but smaller players aren’t having trouble succeeding in today’s NHL. If the pieces come together, he could be an effective bottom-six forward who can provide some offense for the Devils. That isn’t a great look for one of their top prospects. But McLeod has been playing on the fourth line with players like Kurtis Gabriel and Eric Tangradi most of the time. And chances are he isn’t going to put up great numbers with linemates who don’t score much. That said, there are signs McLeod is coming along. Even though he’s a pass-first center, he has 10 shots on goal in his last four games, bringing his total up to 18 shots on goal in 15 games played. And that’s a good sign that he’s starting to become more comfortable in the NHL. If he keeps it up, he should get his first NHL goal in short order. It’s easy to see what the Devils like in McLeod. He skates really well for someone who’s 6-foot-2, 188 pounds, and he’s solid at both ends of the ice. I don’t think he’ll end up being the high-end scorer the Devils hoped he would when they drafted him 12th overall in 2016, but he can still be an effective middle-six forward, similar to what Travis Zajac has been for the Devils throughout his career. Another one of the Devils’ top prospects, it’s possible Anderson has looked the best from the ones called up. He only has four points in 29 games, but is holding his own at five-on-five on a bad team— the Devils have an xGF% of 48.84 percent and a CF% of 48.37 percent with him on the ice. Anderson is also a solid two-way forward and has earned time on the penalty kill. He’s handled the minutes well and hasn’t been on the ice for a goal against in over 40 minutes on the kill. What he needs to work on is his offense, and as Devils head coach John Hynes stated a few weeks ago, Anderson needs to be a bit quicker. Anderson is a similar type of player to teammate Blake Coleman, who’s an effective middle-six forward that’s great at killing penalties. 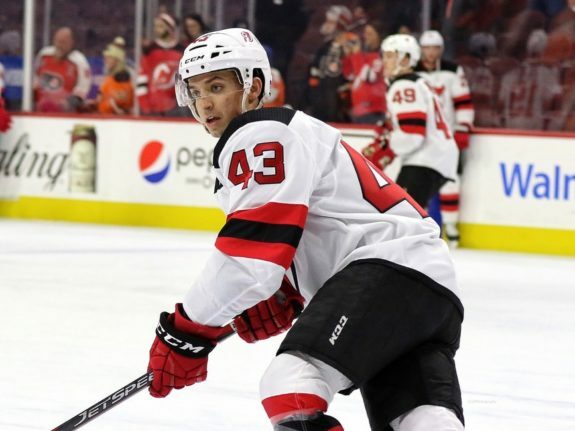 Once he finds his offensive game, he should be able to play a role much like Coleman’s for the Devils down the road. Some time in the AHL to finish this season should help him find his scoring touch. Quenneville has produced in the AHL, averaging nearly a point-per-game, but it hasn’t translated in the NHL, where he has one point in 19 games. His underlying numbers at five-on-five haven’t been great either — the Devils have a 45.25 xGF% and a 46.43 CF% with him on the ice. Staying healthy has also been a problem for Quenneville, as he’s only played in 51 combined games between the AHL and NHL. Time may be running out for Quenneville with the Devils. It’s his fourth year with the organization, and he’s yet to crack the lineup as an NHL regular. He was a healthy scratch on more than a few occasions and only played fourth-line minutes when in the lineup. With only six games to go, the Devils could’ve kept him in the NHL but decided to return him to the AHL for the remainder of the season. A fresh start for him elsewhere could be in his best interest. 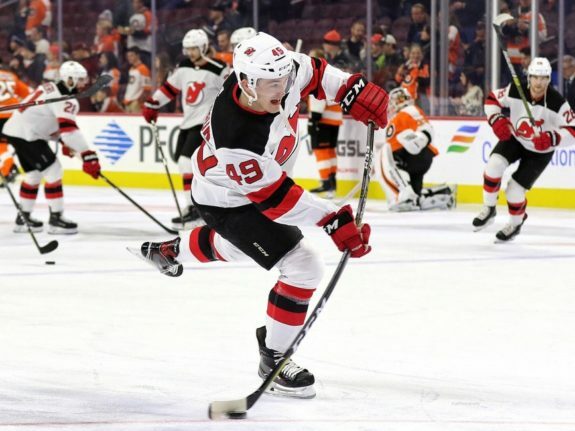 The Devils haven’t had many of their defense prospects play in the NHL this season, with the two most notable being Colton White and Josh Jacobs. White was a fourth-round selection of the Devils in 2015, while Jacobs was a second-round selection in 2014. White played in only three games, but he looked like someone who needs plenty more time in the AHL. The Devils had an xGF% of 42.5 percent and a CF% of 35 percent with him on the ice, which is not good. He only has 25 points in 59 AHL games, so I don’t think there’s much offense there either. The best case scenario is he turns into a depth defenseman in the NHL. It’s hard to get a read on Jacobs, who became the ninth Devil to make his debut this season, with him only having played in one game. He’s been Binghamton’s best defenseman this season, so he earned the call-up. He’s a physical presence on the back end, but there’s not a lot of offense to his game. The best case scenario is he ends up as a bottom-pair defenseman in the NHL. If that sounds discouraging, it shouldn’t because the Devils’ best defense prospects haven’t turned pro yet. Ty Smith, the Devils’ top overall prospect, will be a good candidate to make the team next fall. Reilly Walsh and Jeremy Davies, two of the top defensemen in the NCAA, could be closer to playing in the NHL than not, too, so things are looking up on the back end. 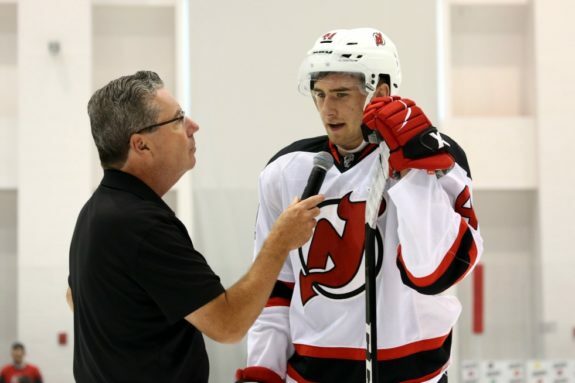 The Devils will have open roster spots next season, whether it’s up front or on the blue line. And they aren’t going to be able to fill all of them through trade or free agency. It didn’t come without some struggles, but McLeod, Anderson, and Seney will be in a better position to compete for those spots in September. And the Devils will be banking on them to earn it, too. Playing in the NHL can be a shock at first, especially when lacking prior pro experience. Now they know what it takes and what they need to work on heading into 2019-20 when the Devils need them to make a real impact.